For perfect, evenly browned bacon, try baking it in the oven. Not only is the bacon perfectly cooked, there's no stovetop splatter or burnt-on mess on utensils and pans. And you won't be burned in the process! Another plus, it needs no attention or turning; the strips of bacon come out of the oven perfectly browned and flat. All you have to do is line a baking sheet with foil and place a cooling rack in it. Or spray the foil with nonstick spray and lay the bacon right on the foil. Let the oven do the work while you go about other tasks. Keep the bacon plain or flavor it lightly with freshly ground or cracked black pepper, brown sugar, or a drizzling of maple syrup. Line a large rimmed baking sheet or two jelly roll pans with foil. 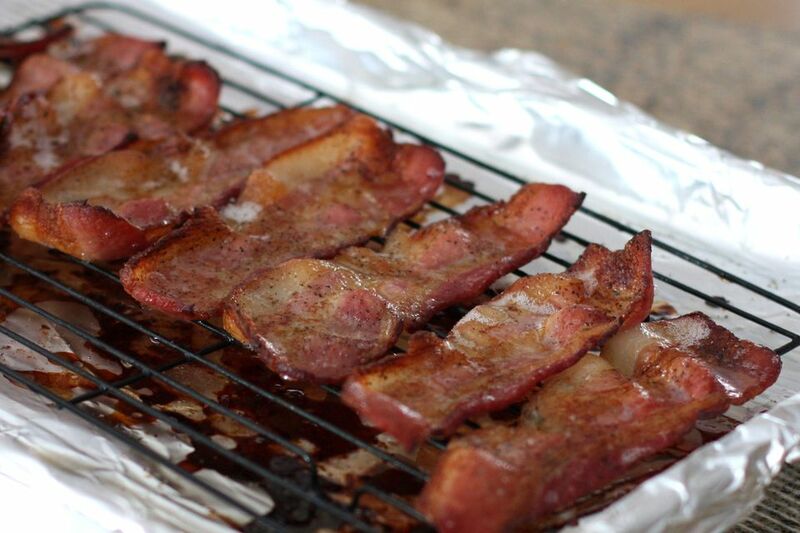 Place a cooling rack in the pan and arrange the bacon on the rack. If you don't have a rack that will fit in the pan, spray the foil with nonstick cooking spray and arrange the bacon on the foil. Bake the bacon for about 26 to 30 minutes, until the bacon is nicely browned. Thin strips of bacon will take less time than thick strips. When you begin to smell the bacon, start watching. Transfer the bacon strips to paper towels to drain.